The origin of tattoo designs is a subject that has always fascinated me. Where do these designs come from? How do they work their way into the tattoo business? Any working tattooist will tell you stories about their customers who bring in their own designs to have tattooed on their bodies. To me, this is the lifeblood of our business. You may have read the well-researched history of "Pharaoh's Horses" compiled by Randy Tyree and Palmer Utterback. This image was a back and chest piece staple in the tattoo business from the turn of the 20th century up to the 1950s. The earliest example of Pharaoh's Horses that we have in the Archive is from the Gus Wagner (1872-1941) collection. This design is seen in reverse of the original and the horse heads are framed with leaves and flowers. 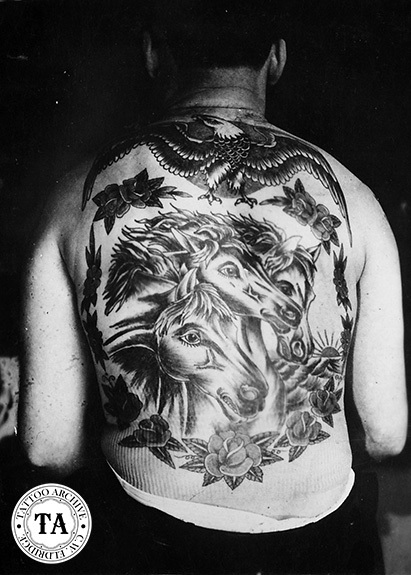 By the 1920s, Pharaoh's Horses were showing up in tattoo supply catalogs along with other classic designs like the Rock of Ages and The Last Supper. Images such as these came to tattooing from the larger religious art world. A customer may have brought these images into the tattoo shop, or a tattooist may have seen them and drew them up as tattoo designs. Much like the chicken and the egg, it's hard to say which came first! But the Pharaoh's Horses design stuck and the list of tattooists and attractions who wore this design reads like a Who's Who of American tattooing. Following is but a short list of such greats: Max Bohm, Tommy Tomasulli, Jay Lester, Andy O' Henry, Capt. Don Leslie, Sailor Carl, Bertie, Captain Elvy and none other than the famed New York City tattooist, Charlie Wagner, who wore this design on his chest. Percy Waters (1888-1952) probably did more to spread the Pharaoh's Horses design than any single person in the tattoo world. He sold the design in his supply catalog, and photographs of his tattooed version of the image is everywhere. Waters liked this image so well that he used it on the cover of his How-to-Tattoo booklet. George Fosdick (1885-1951) also had a fondness for the Pharaoh's Horses design and several photographs and drawings in the Archive's collection shows his renderings of this image.